Ever felt like you were not achieving your potential? Felt like opportunities just weren’t appearing for you? Not meeting the right people… job not inspiring… distractions / problems getting in the way of you living your life? Feel others have lost sight of who you really are and just don’t see you? Or have you lost your Sense of Self in the World too? The Inner Circle is your Everyday How-To’s; as you step outside of this ‘comfort zone’, you face progressively more complex personal challenges and a myriad of possibilities for your life based on all your potential skills. Clear Development Paths may already be in place without you realising it including the necessary opportunities to help you achieve them. 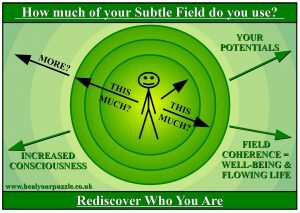 This is a subtle multi-dimensional activity as well as being grounded in Reality in your Conscious Self. As you step forward along your Path, you learn about these greater complexities of who you are; you integrate them into your Everyday, your Mind Map updates and you are ready for your next step. The more of your Mind Map that is involved at any one time, the greater the effect on you as a person, potentially stimulating great motivation and personal growth but can also cause overwhelming stress, and maybe illness if you are not able to process and shape all aspects in a way that keeps you focused and on track… this is part of the challenge… part of your Journey!